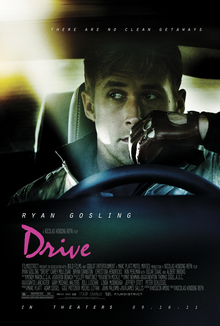 Drive lacks familiar action beats. It’s decidedly off-beat, but that is not to say it lacks a beat. On the contrary, what we have here is a genuine composition, like a poem or a song soaked in blood and axle grease. Nicolas Winding Refn, the director of the manic, lo-fi, and mad Pusher trilogy, has adapted James Sallis’ novel Drive into a succinct and weirdly beautiful film that skirts the borders of the sublime. Don’t worry, I’m not being pretentious – it’s just that Ryan Gosling’s protagonist is so preternaturally cool he’s basically the Buddha of violence. In Drive the bejeweled vistas of black LA nights and the washed out gold of LA days host the working worlds of our protagonist (Ryan Gosling). Eking out part-time work as a mechanic and Hollywood stunt driver, he also sidelines as a criminal wheelman, offering his clients five minutes to do their illegal business before his time is up. If it sounds somewhat like The Transporter, you’d be right in the basic premise. The followthrough is something else entirely. Whereas The Transporter was a fast and furious sock ‘em up, Drive deliberately hearkens back to moto-films of the ‘70s and evokes the sounds (and opening credits) of the ‘80s. Its charm and the foundation of its critical acclaim lies in its idiosyncratic pacing and the laconic Driver. As the film shifts into gear the muteness of our protagonist intrigues as much as it maddens. Gosling acts in several scenes with his eyes and shoulders alone, his posture a constant indication that while the character is dumb his mind is forever alert. As the plot unfolds we gradually understand that there is a very likely possibility that wherever the driver comes from, and whatever he did before, it was nasty. Gosling’s transcendent Buddha has shed the trappings of personality and social graces and become an island unto himself. He is self-contained and indomitable, a superhuman force in a retro-Hollywood fashion. The story is very simple and very familiar, and director Refn reminds us that simplicity and familiarity work in our favor when given the twist of unique vision. A young mother with child in tow moves into the driver’s apartment building and soon accepts him into their lives. A friend to young Benicio (Kaden Leos) and something more to his mother Irene (Carey Mulligan), the driver’s cool demeanor melts when Irene’s husband (Oscar Isaac) returns from prison. Unfortunately, the husband’s old partners are not quite finished with him and the driver is soon involved in freeing the family from the illicit ties that bind. Things get bad. Then things get very bad. And then the driver gets angry. You wouldn’t like Buddha when he’s angry. Just as in Pusher, Refn’s camera is both personal and technical. Breaking flashy convention, the very first chase scene is filmed entirely inside the getaway car. And much like that first chase itself (clear, tense and methodical) each scene before and each scene after is composed just so, precisely, like a fine-tuned machine. It purrs too. There are only six songs on the soundtrack and they repeat when the camera slows down. There are times when the slow motion verges on Snyder-esque gimmickry, but overall it emphasizes the otherworldly tone of the film and the off-beat mindset of its protagonist. The same cannot be said for the gore. An over-reliance on CG blood detracts from the hand-craftedness of certain scenes, which is always a bummer, but in a film as old school as Drive it’s too jarring to ignore. Quibbles aside, there is something trance-like about Refn’s first American film. At its best, the slow motion stings like a scorpion, for time in the driver’s eyes slows down and the camera shares his perceptions; lights in an elevator will rearrange themselves to highlight his passionate attention. There is a primal sense of tension, the precursor to movement, in even the slowest moment. Its anti-hero’s shocking intensity as well as the all-around brilliance of the supporting cast,* combined with its lush Los Angeles landscape and pulsating silences makes Drive one hell of a sleeper surprise. Remember, for those who seek Buddha: Life is suffering. *Bryan Cranston and Albert Brooks absolutely kill it in their small but essential roles. In this movie u cant avert your eyes away from Ryan Gosling!! An American treasure. Thanks for the like!